Marxist revolutionaries believed the left needed to seize control of the means of production and create some form of political socialism or communism, though there were many disagreements with the Marxist revolutionary camp about what that political system should look like. Left anarchists, Trotskyists, Leninists, Stalinists, and Maoists all had very different ideas. Some of them were quite totalitarian, and none of the non-totalitarian variants have been successfully implemented on a national scale. Since the collapse of the Soviet Union, genuine revolutionary Marxism has become quite rare in modern geopolitics. Cuba is probably the best active example, and many revolutionary Marxists do not think the Cuban regime has successfully implemented revolutionary Marxism. 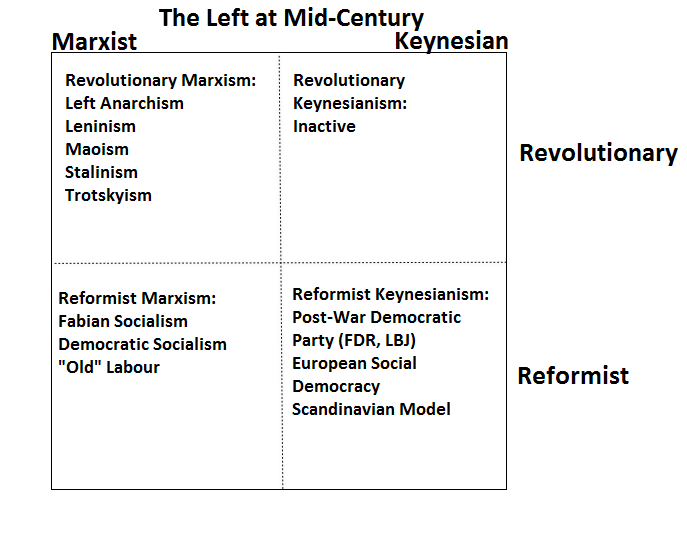 Marxists reformers were often called “Fabian Socialists” or “Democratic Socialists”. They believed that the means of production should gradually be nationalized through the extant democratic process, without making comprehensive changes to the political system. British Labour Party leader Jeremy Corbyn is an active example of this type. Keynesian reformers were less interested in seizing the means of production except insofar as nationalism proved to be the most effective economic strategy for managing some sector. Keynesians were more interested in regulating and reforming the capitalist economy to make it operate in a more sustainable and equitable way. They did not consider it necessary to replace capitalism with some socialist alternative. Bernie Sanders calls himself a democratic socialist, but his policy platform is much more Keynesian reformist. From the depression until the 1970’s, Keynesian reformism was the dominant political ideology in the developed western democracies. I have never encountered an example of a Keynesian revolutionary–Keynesians were predominately committed to the extant political system and believed it was possible to enact effective Keynesian reforms without changing that system. Given the failure of Keynesian reformers to prevent their regulations and and redistributive policies from being whittled down over the last few decades and the awful 2008 economic crisis that resulted from that, we might think we would see Keynesians looking for different political structures that might be more able to sustainably implement Keynesianism, but so far this has not been forthcoming. Despite these significant differences, all of these leftists believed that inequality was fundamentally an economic problem. They all operated from a core shared understanding of how an unregulated capitalist system creates suffering and injustice and they all proposed different policies or political structures designed either to appropriately regulate capitalism or replace it with an alternative economic system altogether. Advocates of status equality challenge that shared foundation. These proponents of identity politics argue that the inequality problem primarily consists in the way that people from marginalized groups are mistreated by people from privileged groups. In contrast to distributive injustice, which takes the form of clear, measurable disparities in various good and benefits, status injustices are subtle and unlikely to be recognized by the privileged people to perpetuate them. Especially subtle versions of status injustice are termed “microaggressions”. For people who focus on status equality, it is the race, gender, religion, culture, ethnicity, language, or other such social group identifier that causes mistreatment. Racism, sexism, ethnocentrism, and other such ideologies perpetrate injustice independent of the economic system. On this view, economic differences often become symptoms of broader group inequalities rather than causes. In a sense, this split mirrors the old split between Hegel and Marx. Marxism was initially a reaction to Hegelianism. Whereas the Hegelians believed that ideologies determined the nature of the state and the nature of the state determined the economic system, Marxists believed that the economic system determined how people would relate to each other and what sort of ideologies those people would subscribe to. Marxists see racism and sexism as products of the economic system while modern Hegelians would see racism and sexism as causes of the economic system. In that sense, identity politics and the focus on status equality is a return to Hegel. During his talk, Professor Wolff gave an example of something he considered a status inequality. Research has indicated that in comprehensive schools, the primary social division among children emerges along classist lines between the affluent, upper middle class children and the those who are poorer (i.e. either working class or on welfare). Affluent children tend to hang out with each other and they tend to have similar home lives with a great deal of structured out of school activities, both after class and on weekends. The working class and poor children tend to hang out with each other and they tend to have much less structured home lives. Their parents are often still at work when they come home, and they often have extensive periods of unstructured, unsupervised time. Wolff told us this story primarily interested in how these two groups of students gradually grow to identify with those who are in the same class and grow to identify against those who are in the other class. What he did not recognize is the way the economic system produces these classes–the kids whose parents are not around to structure their lives live the way they live because their parents work longer hours for lower pay. This creates stress on the entire family, often contributing to divorces and separations which further weaken poorer families’ ability to generate sufficient resources and cause the parents to be even less available to the children in the home. The problem of poorer children being socialized differently from affluent children is in large part a distributive problem–poor parents have been distributed an inadequate amount of financial resources and as a result they have been forced to work more, denying them the time they need to parent their kids in the way that affluent families do. If we recognize the importance of this distributive injustice, there are clear policy solutions to this problem–we need to increase the wages and/or welfare benefits of poorer families so that at least one of the parents can be regularly available to children in the home. These two kinds of damage lead to dysfunctional home environments which cause poorer children to struggle academically. They end up receiving inferior educational training, which inhibits their own abilities to get decent jobs, which perpetuates a cycle of poverty. Alongside this poverty also comes cycles of abuse. The appropriate solution is clearly a redistribution of financial resources to poor and working people so they can spend more time with their children and reduce the stress burden on the family unit. This can only be seen if we take seriously the possibility that economic structures have operative effects on the way people behave and relate to each other. Whatever we think of Marxist political systems, this is an undeniably valuable contribution to the way we think about and address social problems. Hegelians are not able to understand the problem of family dysfunction in this way. But we cannot understand these social problems exclusively through class–Wolff is right to point out that there are other things going on. One of the key reasons it is so difficult politically to convince people to do anything to restore the strength of the family is that many affluent people lack empathy for these poor families and blame them for their own dysfunction. This is sometimes motivated by racism and xenophobia. But the way in which this racism and xenophobia operates is telling. While it is true that many people who express implicitly racist views do not recognize them as such, it is also true that these racist views are themselves clearly Hegelian in structure. Implicit racists will tell you that the reason poor families have become dysfunctional is a cultural problem–they will sometimes call this a “culture of dependency”, but sometimes they will go as far as to explicitly identify it with a particular race or ethnic group (e.g. “black culture”). These people will accuse the poor of being morally responsible for their own family dysfunction by alleging that the beliefs and cultural practices of poor families are themselves fundamentally to blame. Like Hegel, these people take ideologies and culture to be foundational, rather than economic structures. For that reason, they are unable to see the cyclical way in which economic structures produce family breakdown. In modern society, racism, sexism, and other oppressive ideologies justify themselves on fundamentally Hegelian terms. They justify dismissing the suffering of poor people on the grounds that these people must have ideological or cultural beliefs for which they themselves are responsible that cause them to be in the situation they are in. Bizarrely, racists and anti-racist practitioners of identity politics have this assumption in common–both believe that the fundamental cause of poverty are sets of ideological beliefs. For the conservative, the causal belief is a culture or ideology of welfare dependency, a view that is very often implicitly racist or xenophobic. For the identity politics leftist, the causal belief are the conservatives’ implicitly racist views, for which the conservatives are personally responsible. For these reasons, identity politics leftists believe the appropriate course of action is to “call out” conservatives for their implicit racism and urge them to “check their privilege”. But is this really any fundamentally different from demanding that the poor abandon some sense of entitlement? Both of these groups are blaming individuals for the way they think because they believe that ideas and beliefs are foundational, because they are Hegelians. As a result, they are both unable to see the material process by which these beliefs form, and because they cannot recognize that process, they cannot effectively advocate for policies that might remedy it. We can see this most clearly in the kind of political action the two kinds of leftism recommend. The Hegelian leftists are always asking us to start dialogues, to identify forms of oppression and to call out the people who express the ideas that perpetuate that oppression. For them, the only way to change the situation is to change people’s minds. Unfortunately, because Hegelians view ideas as foundational and hold people personally responsible for their beliefs, this results in the hostile bullying of conservatives. What is intended as “constructive dialogue” instead morphs into contemporary “call out culture” which thrives on mob politics and witch hunts facilitated through social media. Even when Hegelians recognize ideologies as systemic or hegemonic, they do not see them as integrated outputs of a wider economic and political structure and so they can only respond by challenging the ideology’s hegemonic status. The fundamental economic and political structure is allowed to proceed. That system reproduces injustice and it reproduces the ideologies that facilitate that injustice. People’s beliefs are the result of socioeconomic processes, and we must engage with those processes to meaningfully change them. Simply arguing with them and calling them out is not going to produce fundamental change. By contrast, Marxist leftists (Marxist only in a very broad methodological sense of prioritizing the economic system–they can be either substantively Marxist or Keynesian) see immediate policy actions we could take that would make a huge difference, irrespective of what people believe. If we raise wages and welfare benefits so that parents in poor families can spend more time with their children and experience less familial stress, we can make a tremendous difference both to the lives of poor children and to society as a whole, which benefits from a better educated, better socialized, and more productive citizenry. As people emerge from these cycles of poverty and abuse, conservatives will no longer be able to associate these subgroups with crime, poverty, or other negative things, and they will no longer be able to convincingly attribute the situations these people find themselves in to “black culture”, “the culture of dependency”, or some other such thing. Changing the economic structure of our society will result in changes in the way people think about our society. In this way, status inequalities are often directly tied to distributive inequalities. By changing the economic structure and alleviating distributive injustice, we simultaneously elevate the social status of marginalized groups by breaking the association between these groups and the adverse social behaviors that conservatives currently misattribute to their culture. So when Wolff argues that we ought to pay attention to status equality rather than distributive equality, he is treating as separate that which is fundamentally linked, and when we focus on identity and engage in a Hegelian form of politics that makes ideology the focal point, we neglect the simple policy changes we could make that would alleviate a great deal of suffering and injustice. Even those we do not usually associate with poverty are affected by the consequences of what you have so brilliantly described (through crime, social instability, discrimination,… ultimately war, etc.). That’s the most important message that need to be put across. Very true, right wing economic policy has corrosive effects up and down the social gradient.